Intipata is a fairly newly discovered site on a hill several hours from Machu Picchu. It is not on the beaten path, and is currently under excavation. The name Intipata was thought up by a member of his expedition, and means 'Sunny Slope'. Not only because of the number of terraces, but also because of the absence of plazas, religious structures or fortifications, there's little doubt that Intipata was primarily an agricultural settlement, but it probably had a strategic function as well. 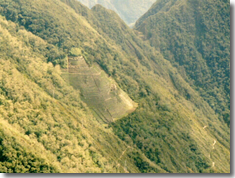 From Intipata you can see across to the lookout platform on the top of Cerro Machu Picchu, and down to the Inca site of Choquesuysuy. Messages could be transmitted to the mountain city of Machu Picchu from the floor of the Urubamba below through the lookout point on the top of Intipata.